Pompeii’s Schola Armaturarum (School of Gladiators) has reopened after a three-year restoration. The school was used to train gladiators in combat, as well as to host feasts. The building collapsed in November 2010 due to heavy rains. As part of the restoration, workers pieced together brightly colored frescoes that had fallen apart in the collapse. Archeologists also discovered amphorae in the building, indicating that its inhabitants had stored wine and oil in the jars. Of more than 100 gladiator schools built across the Roman Empire, just three remain: this one in Pompeii, one in Rome, and one in Austria. 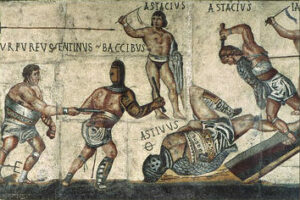 The Pompeii gladiator school will be open to small groups of tourists on Thursdays. “Visitors will be able to see what remains of the association of gladiators of ancient Pompeii,” said Massimo Osanna, director of the archaeological park of Pompeii. Like the rest of Pompeii, the gladiator school was preserved underneath layers of ash when Mount Vesuvius erupted in 79 AD. Today, the site is still under excavation, with new discoveries and restorations occurring often.